It's no secret that I like to have fun with my family. If I had to put myself into a homeschool box, I would probably call myself a Hippie Homeschooler. I am not super-consistent or scheduled; we do have a routine but not a schedule. I am easily distracted and interrupted and say yes to too many side things. So in August of 2014 I decided I needed to do something with homeschooling so that I would be held more accountable so my kids would be more on track, and that's where virtual school came in. This past year of virtual schooling has been great for me and for the kids, but I did put off their math and we are still scrambling do get caught up before state testing. To me, state testing and the three times per school year our facilitator has to come to our house to do testing are the trade-off for the benefits of virtual school: $45 per year per kid, high-quality Calvert curriculum, extra tutoring, field trips and more. I'm seeing, though, that we need to go back and touch on some things that I didn't touch on when I was busy having babies and was deep into my wonderful life as a woman married to a man who travels. There were times when I felt like I was merely surviving and trying to be a good mom was #1 over being a good teacher. Things fell off the radar. I also got busy with doing things on the side to make money and am admitting that I spent too much time on those things and not enough on homeschooling. But all that is going to change. Log into CTCMath.com and see what concepts we have been missing. Type those up into an Excel spreadsheet so I can see at a glance who needs to be doing what and about how long it will take us ... do we need to do one CTC lesson per day per kid or does this kid have it all down and only needs one lesson twice a week? Does this kid need to be doing two lessons a day in the morning before we hit the pool? Keep working with them on money and time concepts. Speaking of the pool ... it doesn't open until noon so going there will be a great incentive to get their homeschooling done. Have my struggling reader do 20 sight word flash cards with me each day and some from a favorite book. She works best at night, so we can do those things then. The older boys read great so no worries there. Eva is entering 1st grade and Samuel kindergarten, so just making sure they know letter sounds is about all they need. Read from The Story of the World to the kids at night and try to get through two volumes before school starts up again. Some of the textbook stuff can be so dry but The Story of the World makes it all come to life. Do science experiments at home and don't forget that even though the big kids have done them already, that doesn't mean they don't want to do them again. Why not let them do it twice during their school career and let the little kids get a chance to try them?! I remember being in school and rushing through some of the fun things and wishing we could have done them again ... like the time in 6th grade when we got to make crepes! I sure could have benefited from more cooking situations in school!!!! Work through the Calvert technology lessons ... a couple a week until they are all done. 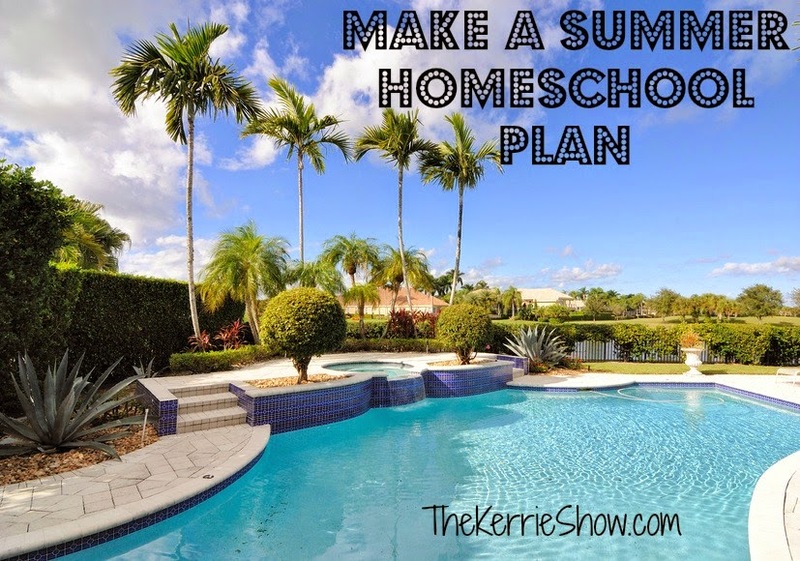 As a homeschooler, do you have summer school? Even parents with kids in school often have their kid do some tutoring or workbooks during the summer. Some schools assign summer work to keep minds fresh. What do you think about this? I'd love to hear from you!